Book lovers rejoice, Indigo on Robson opened its doors late in October at 1033 Robson Street. This new flagship store spans two-storeys and 29,000 square feet with a warm and inviting design inspired by our beautiful city. Beyond books, you'll find a curated selection of Indigo-designed lifestyle products, an IndigoKids department, as well as an in-house Starbucks. One group of West End residents is mad as hell, and definitely not going to take it any more! The iconic green and yellow Berkeley Tower at the corner of Davie and Denman was the first residential High Rise constructed in Vancouver's West End. Completed in 1958, it is home to a diverse community of long term-tenants - some of us have been here for up to 40 years. Today the residents are under threat of renoviction as Reliance Properties, which purchased the site in 2016, is planning to use renovations to justify evicting every tenant, starting in the spring of 2019. An eviction means a new lease – the only way Reliance can substantially increase rents. The Supreme Court of British Columbia has ruled that renovations cannot be used to justify evictions if tenants are prepared to vacate their homes during the renovations. We have offered to move out temporarily so the renovations can be done. Reliance has refused to explore this option. Jon Stovell, the president of Reliance, called the proposal "impractical" and has publicly said that the evictions and new leases are necessary to make the building profitable. Among other demands, tenants are calling on Reliance to halt all renovictions at Berkeley Tower and to engage with the tenants to determine if the renovations can be done without evicting. They have also petitioned the City of Vancouver to withhold permits from Reliance until they explore whether or not evictions are necessary. Tenants spokespersons point out that this application, if successful, will destroy 58 affordable housing units and replace them with 52 unaffordable, likely luxury units. 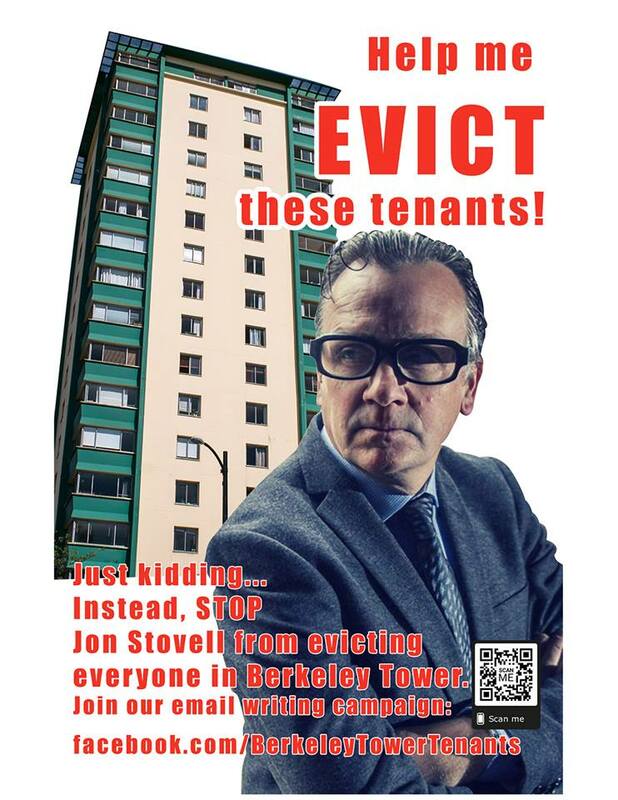 To learn more about the tenants’ protest and follow their progress, visit their website here. Each year at this time the Parks Board conducts work on the rocky cliffs along parts of the Stanley Park Seawall. This is done to maintain the safety and physical integrity of the seawall. With many West Enders using this beautiful feature in our own backyard for regular walks, please note that this work is now underway, through to November 16. The section from Prospect Point to Third Beach, will be closed from 7 a.m. to 5 p.m. Please pay attention and take the posted detour paths during your stroll. Whether you are following your new exercise regime or simply enjoying a beautiful fall day, your safety is paramount.